Long life is a primary attribute necessary for all building materials and a key component of resilience, but is especially important for structural materials and finishes in areas where moisture from atmospheric conditions or inadvertent exposure to moisture occurs. Even though all materials need to be protected through effective claddings and barriers, it is reasonable to assume some breakdown of those protections will occur. Plumbing or roof leaks are also unplanned but do occur. Similarly, a breakdown in the building envelope creates opportunities for pest like termites and carpenter ants to attack a structure. Consequently, choosing materials that won’t sustain significant damage from moisture or pests is an essential. Corrosion resistance. Cold-formed steel has a resistant coating that effectively protects steel from corrosion. This coating must meet the requirements of ASTM A1003 “Standard Specification for Steel Sheet, Carbon, Metallic- and Nonmetallic-Coated for Cold-Formed Framing Members.” The recognized test standard for measuring corrosion resistance is ASTM B117 “Standard Practice for Operating Salt Spray (Fog) Apparatus.” Compliance to these standards is assured through the Steel Framing Industry Association Code Compliance Program. This is a mandated program that all SFIA members must meet. With the proper coating and construction techniques, the protective barrier over cold-formed steel will last nearly 700 years before the level of corrosion resistance deteriorates, even under extreme conditions such as near aggressive salt-laden waters. Unlike other structural materials, steel can be ordered with extra heavy zinc or similar coatings for even more durability. New types of metallic coatings have also been recently introduced, referred to as EQ (equivalent) coatings, and used to supplement the layer of zinc to achieve higher corrosion resistance performance. Another critical characteristic for building materials in moisture mitigation is water retainage. Some materials absorb water in a flood situation and exacerbate the situation. It is important after a flood that the space is dried out as quickly as possible. The EPA has stated there is a window of 24-48 hours to effectively reduce the potential for mold propagation. That time window can be severely taxed if the building materials in the space absorb and hold moisture. Steel does not retain water. Termites. Approximately five billion dollars of damage occur each year due to termite infestations in the United States and represent a significant threat to the long-term resilience of a building throughout most of the US and particularly in warmer climates. Cold-formed steel is one of the few materials that can resist termites in nearly any climate or building type. Even though it seems like termite damage would be a long-term issue, when a hurricane or other high winds strike, it pays to have a building that performs as designed, versus one that may be weakened by termite damage. 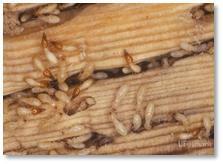 The Formosan termite poses a unique threat to buildings across the southeast and gulf coast regions in the United States, as well as in Hawaii and other tropical locations. Unlike the more traditional subterranean termite that attacks from the ground up, the Formosan termite can establish colonies even on the roof due to its ability to attack aerially. In these areas, using cold-formed steel framing for the entire structure will increase the building’s resilience. Mold. Preventing exposure to susceptible materials during a flood or even under normal conditions in some areas is critical to preventing mold, mildew, and structural deterioration. Although the safest approach may be to elevate a building above the flood elevation, that is not always practical or even possible in some areas. When it is a reasonable approach, extra protection can be added by using another foot or two of “freeboard” above the flood elevation. An alternative approach is to not use susceptible materials in flood-prone areas in the first place. Cold-formed steel is inherently a good choice for any framing where it may get wet during a flood. Unlike wood framing, cold-formed steel is inorganic and won’t provide a source for mold and mildew. Even in extreme coastal environments, the long term life of cold-formed steel framing used in accordance with AISI design standards and U.S. building codes has been shown to be hundreds of years, or well beyond the expected life of a building. The use of cold-formed steel framing can mitigate two of those concerns. Since steel will not absorb water like, it will not retain dampness in the space. In effect, steel framing will aid in drying out the space faster for it won’t serve as a moisture reservoir. 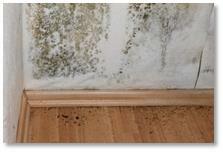 When floods and leaks do occur, organic materials represent the perfect materials for mold growth. 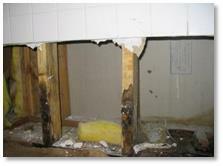 Non-organic materials such as steel don’t support mold growth. Steel is inorganic. It will not function as a food source for mold. Further, steel is dimensionally stable in a moist environment. It will not warp. Walls and floors remain plumb and level in a wet environment.